Coming down the hill into downtown Charlevoix is indeed an "ahhhh" moment. The sight of this bustling community nestled between Lake Michigan and Round Lake is simply beautiful. 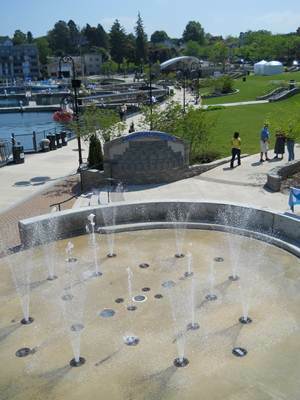 The recently remodeled waterfront park is a jewel complete with a spectacular water fountain. Charlevoix has been the summer place for generations of people from the Midwest and the U.S. And with good reason. There is so much so see, do and enjoy in Charlevoix: Venetian Festival, summer art fair, sailing, boating, beaches, golfing, Apple Fest, Concerts in the Park, and more. And petunias! Charlevoix is known for its petunia-lined streets. A year 'round destination, Charlevoix is near great skiing, hiking, and biking and is at one end of the Little Traverse Wheelway linking Charlevoix through Petoskey to Harbor Springs. Lodging opportunities range from full service hotels to bed and breakfast inns. Dining? The gamut from fine to casual. Things to do? 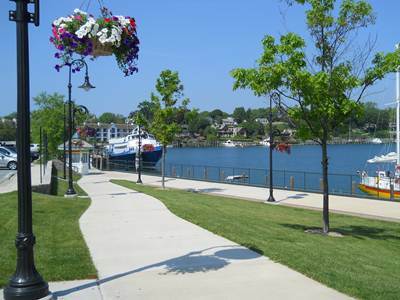 Hop on the ferry to Beaver Island, walk the beach at Fisherman's Island State Park, pick up some fresh smoked whitefish for dinner, and end the day with an ice cream cone and a walk on the waterfront. The perfect place for perfect days. Charlevoix is filled with history. Stop by the Harsha House to learn about the rich history in the area. Do you like lighthouses? There are many in the area to visit. From this website you can visit our sections on Antiques & Home Furnishings, Art Galleries, Farm Markets and Local Foods, Golf Courses, Services, and Shopping. You've come to the right place to explore and more. One visit to Charlevoix and you'll be hooked!